Occasionally, I drag out old projects from their resting and display positions on my shelf, plug ’em in, and give ’em a whirl. It’s fun to watch as past home-brew rigs come back to life, and relive the feelings of wonder, as a handful of parts that I soldered together actually receive signals and in some cases, transmit them too. For me, the most wondrous times in building are those initial moments when a new receiver begins to pluck signals out of thin air. Those times of wonderment are often stretched out over a period of time, as a new receiver build progresses. I usually start with the AF stage of a receiver, and build backwards. The moment when I touch the input of the AF amp, and hear a mixture of hum and a general cacophony of broadcast stations isn’t so much a moment of wonder, as one of satisfaction that I can put that stage behind me and get on with building the real part of the receiver. Wherever the point is when RF is being converted to AF, and you’re hearing general atmospheric noise, it’s a magic time for me. It only gets better as subsequent stages are added, and the receiver begins to hone in on a very specific part of the RF spectrum. Mind you, there is something quite wonderful about hearing general atmospheric noise – it feels like an audio window into a wider world around us. I love that! This is a preamble to the resurrection of the WBR that I built for the 31M broadcast band. Although I was initially happy with it, over time, I had to admit to myself that it seemed a bit deaf. Why was that? The original WBR that I built for the 40M amateur band was sensitive enough. Then I remembered that on the few occasions I had used to it to listen to 41M SW broadcast stations, it had also seemed a bit deaf. Perhaps it was just something about this design that doesn’t do well on AM? With that in mind, I decided to see how my 31M WBR performed on the 30M amateur band. The trimpot is used to set the lower edge of the band coverage, and the 10K value didn’t give me much adjustment range. I managed to get things set the way I wanted them, but suggest the values in parentheses, of 56K for the fixed resistor and 22K for the trimpot, as ones that would give more room for adjustment. If you’re building this from scratch, it might be worth looking into the use of 1N4001’s for the varactors. They’re cheaper and more widely available, and although they don’t give as wide a capacitance range as most varactor diodes, not much is needed when you just want to cover a 50KHz-wide band. You’ll probably need different values for the fixed resistor (if you even need a fixed resistor) and the trimpot. I’d start with no fixed resistor, a 5K trimpot, and go from there, if you do decide to experiment with a different part for the tuning diode. The resulting receiver works well on the 30M band, with good sensitivity. Indeed, sensitivity is rarely an issue with regens – their main weaknesses are poor strong signal handling, and lack of selectivity. I have not yet heard a signal on my K2 that I couldn’t also copy on the WBR. This confirms my growing suspicion that this design just doesn’t cut it for AM, though it performs well on SSB/CW. Another feature of this particular WBR version is the circuit of the LM386 AF amp, which provides enough gain to easily drive a speaker, and seems to have less noise than other high-gain configurations of this chip. I’ve heard from folk who built the WBR as described in the original QST article, and have been told that it has low audio. If you’re going to use that circuit, I strongly recommend that you include a preamp stage, as detailed in this post. Even better would be to use the circuit of the 31M WBR which, as well as including a preamp, also has the higher gain and lower noise LM386 amp stage. That’s the WBR on 30M, and I’m really happy with how it performs there. Posted in Amateur Radio, Ham Radio, homebrew radio, QRP.Tagged 30M Regen, KB6QVI, Regen, WBR, WBR on 30M, Wheatstone Bridge Regen Receiver, Wheatstone Bridge Regenerative Receiver. The WBRs are very nice regens, I intended to use the two that I built (40 and 80) with stand alone QRP transmitters, but I could never figure out to spot the transmitter without blowing the doors off the regen. I love the kitties in the videos – my cat Tosca is pretty emphatic when she wants me to put away the radio and pay attention. The few times that I used a WBR with a QRP transmitter, I had the same problem. I wasn’t going to include the video with the kitties, but some folk have said they prefer them, a sentiment to which I am very sympathetic! 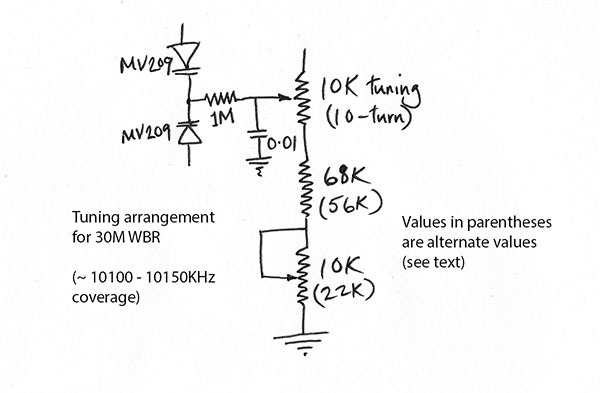 & not good for transmitter-receiver pairings. Mine are a bit deaf on AM Simon, but sensitive on SSB and CW. If you built yours according to the circuit in the original article (or with the circuit board from FAR circuits), then the perceived lack of sensitivity could simply be low audio gain. I used an extra audio pre-amp stage in both of mine. The other circuit element that can affect sensitivity is the inductance between the coil tap and ground. If it’s too low, sensitivity will suffer, but if it’s too high, you’ll overload the detector. I was getting a bit carried away in the video when I talked about using it with a TX. Regens in general aren’t very tame in the presence of transmitters. As stand-alone receivers though, I’m a fan. Thanks for the kind words. As for the kitties, I’d give up my radio gear if I had to, but no-one could ever talk me into parting with my 3 furry gals! Amazing comparison, Dave! I have often thought the biggest drawback to a regen is the problem with spotting your transmitter . As you know most regens fall apart with that strong of a signal. Other than that, they are quite usable, even on a daily basis! Yes, they completely crumble Doug. I have only once used a regen with a transmitter (it was a WBR), and well remember the screeching sound in the headphones, as the receiver screamed like a banshee! Haven’t done much experimenting lately, but think the next regen build will be geared toward shielding to see if it is possible to block out most of the hi level RF, and maybe figure some sort of T/R switch with good port isolation. With such a design an RF stage may be imperative so as to lessen de-tuning with the differing loads. I think if this problem could be alleviated, the simple regen would have much more casual use as a complete station. N0WVA's One-FET Regen Optimized For SSB/CW Sounds Great!